According to an analysis conducted by Anand Lal Shimpi of tech site AnandTech, Apple has released a new iteration of the iPad 2 hardware that positively impacts the battery life of the tablet. Dubbed the “iPad 2,4” based on the three previous versions of the tablet, Apple has shifted from a 45-nanometer, dual-core A5 processor to a 32-nanometer version of the chip. Approximately 40 percent smaller than the 45-nanometer chip, the 32-nanometer version is also the same chip that’s being used within the most recent version of the Apple TV according to Chipworks. The performance of the chip is identical to the previous 45-nanometer version, but the alteration in design decreases power consumption in addition to running slightly cooler than the previous version. 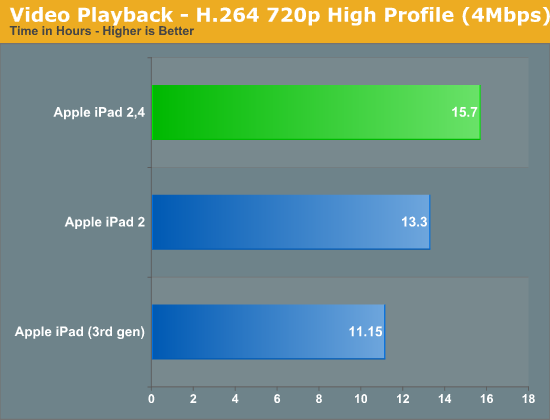 Specific to battery life, AnandTech’s tests indicate that users of the “iPad 2,4” will potentially get an extra two hours of battery life if they are primarily using it for Web surfing, watching movies or playing games. The iPad 2 already gets “up to 10 hours of surfing the web on Wi-Fi, watching video, or listening to music,” according to Apple’s site. Attempting to locate one of the new “iPad 2,4” models may be difficult for the moment as Apple likely has a significant amount of existing iPad 2 tablets to sell. However, Shimpi mentioned that the improved model is preloaded with iOS 5.1 while older iPad 2 models will have iOS 5.0.1 or older. In addition, new iPad 2 owners can purchase an inexpensive iOS application called GeekBench that specifies the version number. While the 45-nanometer dual-core processor is also being used within the iPhone 4S, it’s possible that upgrading the iPad 2 to the 32-nanometer version is an indicator that Apple will shift to the same processor for the next iPhone.